Our unique process utilizes advanced tools and techniques that are academically proven and enable you to coordinate all aspects of your financial life. The end result is a well-coordinated lifestyle that meets your personal objectives, no matter what stage of life you are in. An initial business valuation that is updated annually and incorporated into your personal Intelliplan™. A personal / family Intelliplan™. Business 401(k) or pension strategies that help you maximize your personal wealth. What will you spend your time doing when you retire? Which have you spent more time planning – your retirement or your next vacation? Retirement planning is about achieving financial security and peace of mind. Knowing that you will have enough money, even when the unexpected happens, is critical to any financial plan. Artifex Financial Group will help you plan to get the most from your retirement years. Do you understand the various education funding options? Do you understand the impact of your funding choices on the other options available to you? Will the ownership of your family’s savings accounts affect the financial aid available to you? 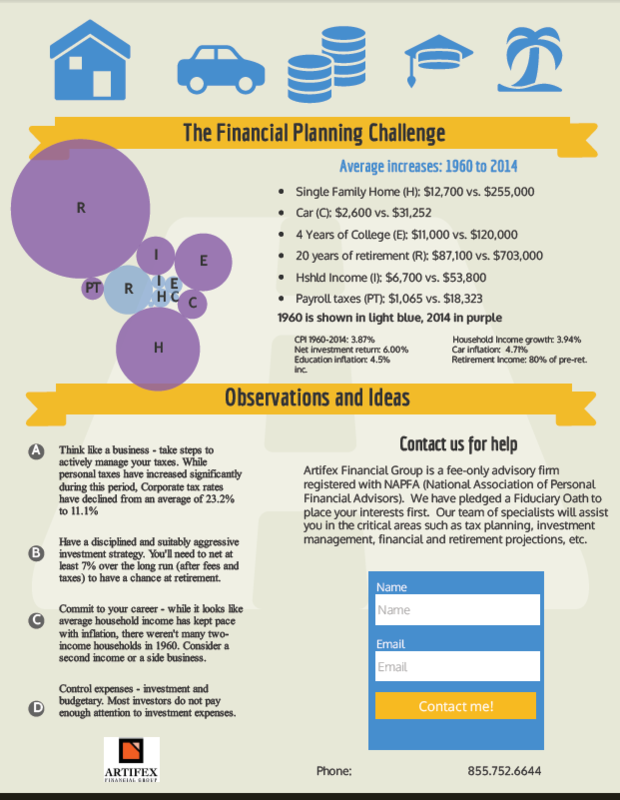 Saving for college is a significant financial planning issue for most families. Median family income has not increased nearly enough to keep pace with rising college costs. And while there are numerous sources of funding available, identifying the right mix of alternatives and maximizing their use is a complex and confusing process. The good news is that there are ways for families of any income level to effectively save for future college costs, and Artifex Financial Group can help you determine the best way for you and your family. Do you understand how your personal net worth may be exposed to major losses? What would you consider to be a loss you couldn’t afford to assume? If you died, would there be a significant financial strain on your family? You will spend many thousands of dollars on insurance premiums during your lifetime. At various times you will probably pay for health insurance, disability insurance, auto insurance, property insurance, life insurance, and more. Determining how much coverage you need, what risks you can afford to self-insure, where you should buy your insurance, and how much you should pay for it are vitally important to your financial security. Artifex Financial Group will discuss these issues in detail and help you spend your insurance dollars wisely. Artifex Financial Group will evaluate with you the pertinent estate issues that impact your life and consider choices that you can then implement with your attorney. If you were told you have exactly 18 months to live, what would you change? The better we understand what is important to you, the better we can help you structure your finances to achieve your goals. Financial advisors can inadvertently try to impose their own goals on their clients. Artifex Financial Group has found the best way to avoid doing so is to use a variety of techniques and approaches to help you clarify and communicate your goals and then help you measure your progress toward them. Artifex Financial Group will help you understand the difference between good and bad debt, make sure you have enough set aside for emergencies and special opportunities, and, if needed, help you gain control over your spending. Get a Copy of Our Whitepaper, "6 Failed Beliefs that Are Damaging Your Financial Well-Being, and What to Do About It"